A dark blue, jasper dip, barrel shaped jug. 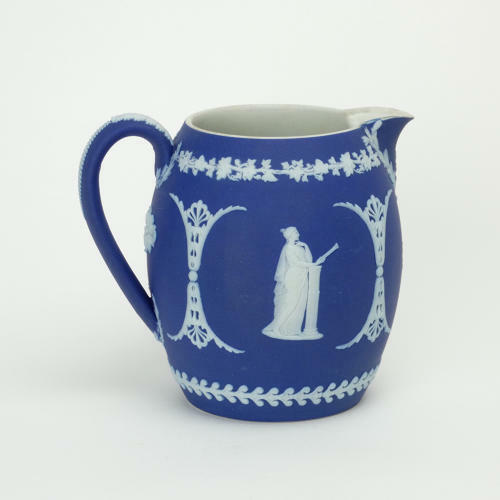 This jug is marked with 'WEDGWOOD MADE IN ENGLAND'. and a single letter 'K'. It dates from c.1920. There is also the impressed number '42' which would be a batch number. It is decorated with one of the Muses to either side. They are divided by anthemions and under the spout are hanging musical trophies. To the rim is a border of ivy and there is a classical scroll border to the base. All of the reliefs are good quality and the jasper dip is a good, rich shade of blue. It is in excellent condition.